Recession? What recession? Some brave restaurateurs are defying the economic gloom and doom and opening new places. We take a look at the design behind a select few. High atop the Museum of Arts and Design, New York’s Robert commands a million dollar view. With a wall of windows overlooking Central Park, and cocktail tables by one of Zaha Hadid’s pet designers, Robert–the restaurant atop the new Museum of Arts and Design–starts with both enviable design cred and a million dollar view. The first serious restaurant by owners Brian Seltzer, whose day job is as an internist, and Michael Weinstein, chairman of Ark Restaurants, this venue is a tribute to Robert Isabell, Manhattan’s top shelf wedding designer, who died last year. Pronunciation note to the pretentious: That’s “Robert” as in the Duluth native Isabell was, not a Frenchified Ro-ber, as in The Colbert Report. On Thursday through Saturday nights, the neon-hued space becomes a piano bar, attracting the crowd spilling out of Lincoln Center, up the street, and other party folk looking for a place to ogle the view, listen to music, and sip cocktails. Previous Incarnation: When it was Huntington Hartford’s Gallery of Modern Art, the 9th floor housed a Polynesian restaurant, The Gauguin Room. It was totally gutted when the building was renovated. Design Challenges: The building’s small footprint and lack of storage space made designing the small kitchen to be hyper-efficient even more critical. 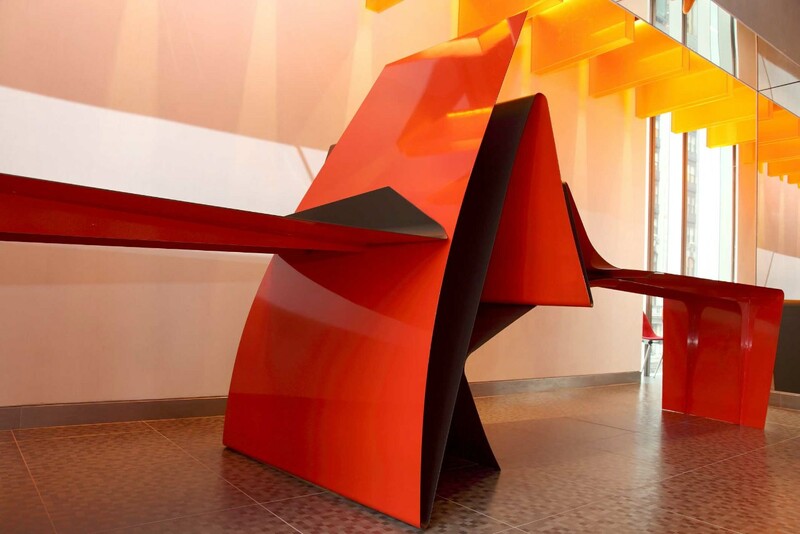 Design Highlights: London-based designer Phiip Michael Wolfson, who worked with Zaha Hadid early in her career, and has since gone on to establish a thriving art furniture career of his own, designed the room’s most dramatic furniture. 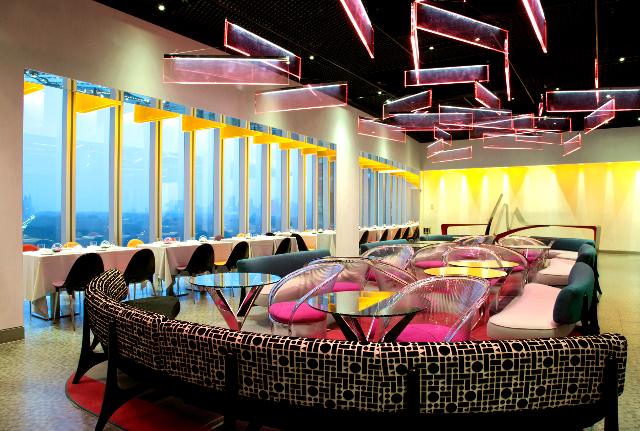 The most striking pieces are a 15-foot sculptural steel Sound Wave communal table and a flock of brass and polished aluminum cocktail tables called Lollipop Variations–doubtless a reference to the famous lollipop windows on the Edward Durell Stone-designed original building. Pink plexiglas mobiles in the center of the room, and orange plexiglas boxes on the periphery, all lit by LED lights, were designed by Johanna Grawunder. A large, flat-screen TV on the back wall features a flower-patterned video installation. Philip Michael Wolfson designed an undulating communal table with a nod to Zaha Hadid’s swoopy design vernacular. 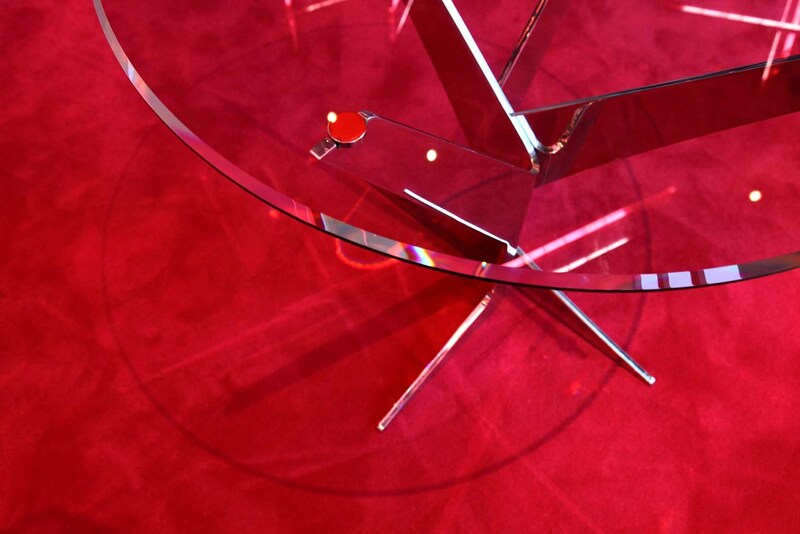 Wolfson’s cocktail tables have mirror-finished legs, which reflect the ceiling’s neon for extra dazzle.